Each day, God blesses us with new evidences of His goodness and mercy. He has blessed my morning today, in spite of the aches and pains and sleepiness that weighs me down. Scripture says, “Not many wise are called.” Herman Dooyeweerd was one of the wise who was called. Second, I was perusing and re-reading from and re-enjoying a great book on the only clergyman who signed the Declaration of Independence, John Witherspoon. Witherspoon, a Presbyterian and a Scotsman, is one of the greatest and most neglected Founding Fathers of the United States. 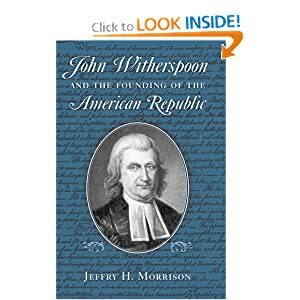 The book I was reading from is John Witherspoon and the Founding of the American Republic by Jeffry H. Morrison. Read it twice several years ago and made underlinings and notes in the book. It is a great study. I must admit to not liking what are generally styled coffee table books. For one thing, I don’t like coffee tables. We almost never drink coffee near or on or around our coffee table and I have run into it far too many times. Coffee table books are the oversized, heavily illustrated books that supposedly adorn our coffee tables for guests to peruse. The abundance of pictures is suppose to enable to the scanning guest to flip through the book with some interest without getting bogged down in too much text. The books contain texts, often by good historians and writers, and the level is usual for more popular audiences. I don’t really like those kinds of books, but I have quite a few. They never fit well on the shelves and are usually placed together with other books of similar sizes and different subject matter. 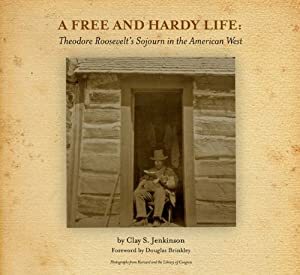 Several years back, I received, without expectation, a copy of A Free and Hardy Life: Theodore Roosevelt’s Sojourn in the American West by Clay S. Jenkinson. It is published by the University of Oklahoma Press, one of my favorite publishers. I have shuffled the book from place to place without ever looking into until tonight. It is a delight. If anyone writes a book about Theodore Roosevelt, and the book is not exciting, that person needs his writing hand broken or his keyboard smashed. And if anyone writes a book about Theodore Roosevelt’s years out west, and it is not an enjoyable book, they can’t write and should not be read, plain and simple. As it happens, this book is filled with pictures and short accounts of TR’s many and fascinating exploits in the Dakotas. It is exciting and enjoyable. Much of the writing is from TR’s autobiography, which I confess sadly to not owning. TR really did punch out a drunken gunslinger in a saloon in Wibaux, Montana, then known as Mingusville. He really did track down the three boat thieves, one of them a potentially dangerous man, arrest them in the middle of nowhere, and march them to justice in Dickinson, Dakota Territory. He really did get bucked off of unbroken horses, one of which threw him so hard that he broke the point of his shoulder. He really did spend more than a month on a badlands cattle roundup, where he really did help stop a stampede. Compared to my rather dull life, and summer too much being spent in the school office shuffling papers, TR truly lived a free and hardy life. I hope there is some young man somewhere in the west who even now is being prepared for future leadership who is punching out drunken gunslingers, tracking down thieves, riding bucking broncs, and stopping stampedes. We need strong men to lead us again. and there for you He intercedes. It is always a delight to hear the coffee maker begin the hissings and drippings that mean that the morning coffee is ready. Morning Bible readings and prayer are the only way to start the day. Then I turn to the books. Speaking of good starts for the day, R. C. Sproul often shows up at my house. At least once a week, he drops by and lately, he has been visiting with me each morning. I wish I could say that R. C. and I were close buddies and he actually was coming into my house each morning and engaging me in some discussion. I have to settle instead for some of his many good books. A few months back, Dr. Sproul’s commentary on the Gospel of Matthew was published by Crossway Books. This book is a hefty hardback of over 800 pages and 129 chapters. It consists of expository sermons that Sproul preached over Matthew’s Gospel. It is part of a series by Sproul called St. Andrew’s Expositional Commentary. Other commentaries in the series include studies through Acts, Romans, and 1 & 2 Peter. Sproul is an extremely gifted communicator. Sometimes, Reformed preachers have dug so deeply in the mines of theology that they cannot speak to normal audiences, including both churched and un-churched people. Sproul is no backwoods fundamentalist. He got his doctorate at the Free University of Amsterdam, which was the center of academic Reformed scholarship in the 20th century. Sproul taught theology at various seminaries, but he is best known for his work at Ligonier Ministries. But in spite of his degrees, his years inside the classrooms of seminaries, and his studies, he is an effective and popular communicator. Through Ligonier, Sproul has had tapes, videos, and books produced and sent out all over the world. Ligonier also publishes a monthly devotional magazine called Table Talk. He has written theological studies, books on every day Christian living, books on Christianity and culture, books on philosophy, and even some children’s books. He also does radio broadcasts. It was late in his career when he turned his ministry work to pastoral ministry. He now pastors St. Andrew’s Chapel in Sanford, Florida. From his expository (chapter by chapter, verse by verse) preaching, he is now producing his commentary series. Sproul does not do in-depth explications or studies in the texts of Matthew. The person wanting more of the theological detail would need to look elsewhere. (I find William Hendriksen’s commentary on Matthew very helpful, and I just acquired Leon Morris’ work, and Charles Spurgeon did a commentary on Matthew.) Anyone wanting to read more extensive sermons would do well to read Daniel Doriani’s 2 volumes or John MacArthur’s 4 volumes. What Sproul does best is to give a short, thought provoking, convicting sound look at the text. His book is excellent for a morning reading. It would work for family time (which we need to restore once again). It is great for the person who is not theologically well grounded, but does not want fluff. It works for the man in a hurry or the woman with too many kids and not enough time. It is good for beginners; it is a good refresher for long-time Bible students. Sproul presents good morning theology. You will pick up on a number of key figures in history–both church and secular history. You will better understand the texts. You will see applications of the Gospel to everyday life and to the broader culture. You will find doctrine, correction, reproof, and instruction (2 Timothy 3:16). Since December, I have been preaching through Matthew. Now, 26 sermons into the series, I am working slowly through the Sermon on the Mount. Now, just beginning chapter 6, I will be working even more slowly through the Lord’s Prayer (or the Model Prayer). Sproul has nine sermons on the Lord’s Prayer. I usually read Sproul early in the week, just to help bring the coming week’s text into focus. And often, later in the week, after I have plowed through some other fine books, I go back to Sproul again. 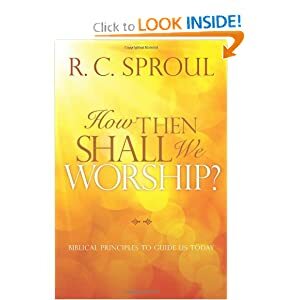 A great and worship-causing book on worship. A Taste of Heaven was published by Reformation Trust, the book publishing arm of Ligonier Ministries. It has recently been reprinted and retitled as How Then Shall We Worship: Biblical Principles to Guide Us Today. Same book, only in paperback with a different title. Books stack well on every flat surface. Rick Bragg so often captures my feelings exactly. A post he had about books, called Words on Paper, describes how he and I both feel. But I hope I will never have a life that is not surrounded by books, by books that are bound in paper and cloth and glue, such perishable things for ideas that have lasted thousands of years, or just since the most recent Harry Potter. I hope I am always walled in by the very weight and breadth and clumsy, inefficient, antiquated bulk of them, hope that I spend my last days on this Earth arranging and rearranging them on thrones of good, honest pine, oak, and mahogany, because they just feel good in my hands, because I just like to look at their covers, and dream of the promise of the great stories inside. More sonnets that most people ever read. I received a copy of Man With a Bull-Tongue Plow by Jesse Stuart a few years back from the Jesse Stuart Foundation (http://www.jsfbooks.com/). Originally published in 1934, the book brought attention to the young writer, who would go on to write many novels, short stories, poems, and other works. In 2011, the book was reprinted by the Jesse Stuart Foundation in an attractive hardback edition. Once or twice I started the book, and many times I shuffled it from one shelf or stack to another, but always kept it close by. This summer, I am reading it in earnest. This book is a collection of 700 sonnets that Stuart wrote when he was a young man. His ability to turn a rhyme was incredible. Stuart was a farmer in eastern Kentucky, who imbibed the native beauty of the land, the invigoration of the cycles of plowing, planting, tending, and harvesting, and the music of the hills. He was something of a transplanted Robert Burns. At first, I thought that this collection would be a number of random poems. But there is a story line to the collection of poems. They give a picture of rural, agrarian life. Yes, it is romantic, idealistic, and heart-warming. But Stuart also notes the hardships, the fears, and the failures of farm life. He describes himself and the energy of youth, but he writes a part of a community, a participant in a way of life, a sharer of the struggles and dangers, as well as joys of life. In some of the recent poems I have read, he described the different people who lived and died in his community. Their hopes, fears, dreams, and struggles are powerfully captured in these sonnets. A one-horse farmer singing at the plow! I sing the strains I know and love to sing. All of my life these are the songs I’ve heard. Yours very respectively, Jesse Stuart. In that opening poem, I sense the impulse of both independence (as fitting a Scot) and connection. These are the songs he has heard. This is what fellow Kentuckian and Bluegrass music creator Bill Monroe called “ancient tones.” This is a man growing food, not shopping for it, but actually connected to the process. It is a poem about hearing: crickets, men working, birds, and the corn itself. There is a connection to Walt Whitman’s Leaves of Grass, especially as Stuart identifies himself and disclaims that his work is art. (And that is without Whitman’s weirdness and perversity.) There is a connection to Robert Frost, who so aptly sensed the connection between the land and the human inhabitants. Then there is a connection to the Agrarians, the Fugitive Poets, who moved toward the modern, but kept looking back at what was left behind. Jesse Stuart’s farm as pictured in Life magazine in 1943.